If you have dogs, part of your responsibility is to train them to be well-mannered, to be able to follow basic commands, as well as to display a few cool tricks from time to time. As an owner, you may also want to improve your dog’s behavior if ever your dog needed correcting. Using treats during training sessions gives your dog something to look forward to. Aside from the usual meals during the day, giving treats to your dog during training can be viewed as rewarding your pet with overtime or bonus pay. As an employee, you work regular hours every day, do your basic tasks, then clock out at 5 pm. You likewise get paid a basic salary every month. These are similar to a dog’s routine activities and regular meals. However, if your boss needed some extra stuff done outside of regular hours, it’s but fitting for you to ask for overtime pay and bonuses. These are synonymous to the treats you offer your dog for complying with training. Treats give your dog something to look forward to in training sessions. Moreover, it motivates your dog to learn what you want it to in exchange for treats. Also, you can use treats to signal to your dog that it’s time to learn something new by making a clear distinction between their normal meals and training treats. Dog treats are effective as lures for your pet dog in early stages of training. In the initial stages of dog training, you may start using dog treats as a lure for your dogs to be in position for training. Because treats are new and different from what they’re usually fed, dog treats excite and intrigue dogs into coming closer to you. Once you have your pets’ attention, you can then slowly condition them into making the connection between training and dog treats. Having treats as the main link makes it so much easier and predictable for both you and your dog. Giving your dog treats at certain points of your training session will help you keep the dog’s focus on what you’re trying to teach it. If you and your pet are just in your backyard or garden, it’s quite easy to keep your dog’s attention on you. During these training sessions, you may offer a plain piece of kibble to your dog, and your dog will happily cooperate with you. However, in training sessions that are conducted in local parks, expect that your usually behaved dog will naturally be distracted by all the stimuli of the unfamiliar or exciting surroundings. Your dog will be distracted by all that he sees, hears, and smells around him. The usual kibble won’t work to keep your pet focused on you. During these instances, you may effectively use special high-value dog treats such as those available at Barking Good to keep your dog’s senses glued to you. Offering more special and rare treats as you go along will work to keep your dog’s motivation up. Once you get into deeper and more complicated training sessions, using additional and rarer treats will spice things up and motivate your dog to keep on meeting the challenges in front of him. You may start giving more delightful treats to reinforce good behavior. Doing so can apply to practical situations. For example, you want your dog to lie down on the sofa when you have visitors in the dining area. 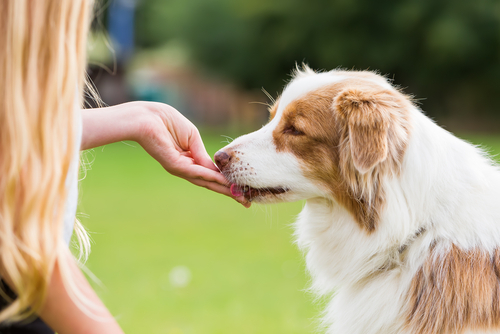 Every time that your dog complies with your instructions, you may give him a treat as a reward. You may effectively make use of treats to achieve long-term results when you use these as reinforcement, not bribery. When you train your dog, you naturally want your dog to exhibit certain skills or behavior in the long-term. You can use the giving of treats as reinforcement. Be careful not to bribe your pet with its treats. When you reinforce your dog’s behavior, you’re rewarding it after it has fulfilled your command or done a good job. The key word here is “after.” For example, your dog has mastered how to catch a stick you throw at it, so you may give a treat after it has done so. Reinforcement will ensure your dog exhibits his trained behavior, even when you taper off treats later on. If, for instance, however, you’re training your dog to catch a stick or toy and your dog just sits and looks at you. Then, you offer a reward and the dog does your bidding, that’s bribery. Bribing your dog with treats happens when you offer the treat before your dog does what it’s supposed to do. Although bribery may get you results right away, it won’t guarantee long-term effectiveness in your training. Dog treats may be used to boost your pet’s nutritional needs. If you go to your local pet store, you’ll literally see shelves upon shelves of dog treats you can choose from. Some of these are so-called “empty” treats, which your dog may enjoy but have no real nutritional value. Most of the time, these “empty” treats may be enough to condition and reward your dog for training performance. However, since you’re giving dog treats anyway, why not take advantage of making your pet healthier by giving it treats that are loaded with nutritional benefits and vitamins? Consult your veterinarian about any deficiency your dog has, which you can address with the right vitamin-loaded treats during training. Moreover, if you’ve been used to giving your dog your leftover food as a reward, switching to nutritious dog treats is better for your dog’s health. The food you consume may contain salt, spices, and herbs that aren’t good for your pet. You may use dog treats in training to address the health issues your dog may have. Depending on the behavior and health condition of your dog, you may take advantage of using dog treats to treat certain characteristics your dog may have. For overweight dogs, you may use treats that are low in fat and calories and that have higher fiber content to help your dog lose weight safely and effectively. If you have a high-energy dog that’s always active, it can benefit from being given treats rich in protein and calories. Such treats will give your dog that extra push and energy during active play sessions that require high agility levels and heavy weight-pulling. For aging dogs that exhibit sluggishness or difficulty in movement, using treats with supplements for muscle and joint care may be helpful. All these possible benefits of dog treats can help you train your pet effectively, as well as give you the means to improve your dog’s health. As with all your health-related concerns, be sure to consult your veterinarian to ascertain the health condition of your dog and to get advice about how these treats can help enhance your dog’s well-being. 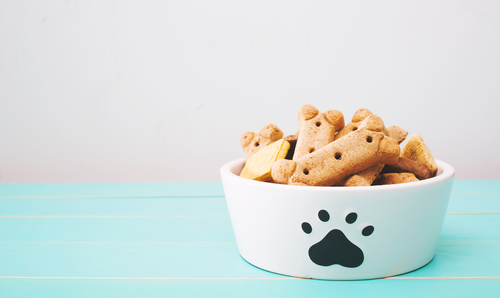 Giving treats will help you establish predictable schedules for your dog. When you separate your dog’s regular meals from his treats, you may more easily dictate the schedule and training patterns for your dog. This will make training sessions clear to your dog and easier for both of you. Dog treats are such an owner-friendly strategy you can use when your dog is training. The perfect treats are in tiny pieces so that your pet can consume these very quickly and so that the treat itself doesn’t distract your dog away from its training. Also, the ideal treats are small so that your dog doesn’t end up consuming unwanted calories. Being small, dog treats are very easy for you to carry around during training sessions. It’s a bonus if the treats you buy aren’t crumbly or greasy. In short, clean treats that come in bite-size pieces facilitate things for you as the owner and trainer. You and your dog can both have an enjoyable time during sessions. Giving treats is a training strategy you can use that can be phased out when your dog progresses in its training. What’s beneficial with dog treats is that you don’t have to be scared of your dog being dependent on it every time that you train. 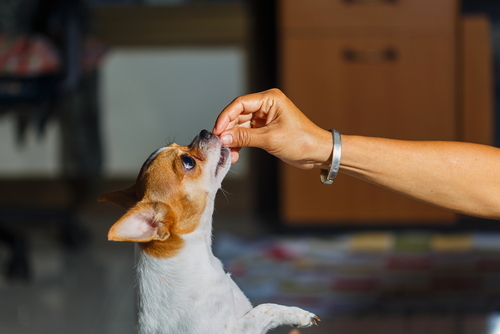 For as long as you use treats to reinforce and not to bribe your dog, you’ll be able to slowly but surely taper off giving your pet treats for every instruction that it obeys. You may actually start rewarding intermittently and focus on giving the rewards for bigger goals that you want your dog to achieve. Teaching your dog new tricks can be quite a challenge, especially if you have quite a strong-willed pet. Many dog owners can relate to your difficulties. Training your dog to acquire new skills and tricks means that you have to always be smart and one step ahead of your pet. You have to be able to discipline the boisterousness, nervousness, and confusion that your dog may exhibit during training. In addition to using your know-how for dog training, maximizing tools such as dog treats can greatly work to your advantage.